Cover photo: Newly elected LIFE MEMBER Murray Martin receiving a presentation from Chair Sarah Howell. When insuring your valuable items (property, car etc) with Vero, quoting the above number results in a commission being made to the Manawatu Branch. Thank you for your ongoing support. Outgoing Club Captain Bryan Abraham was also thanked publicly and presented with a gift to acknowledge the huge amount of work that he has put into this role. This is a full report but about only a half-rally. The Editor said, as she brought me a cup of tea in bed, “No-one has sent me a Ruahine Rally report. You will have to do one.” Here goes. then called for a â&#x20AC;&#x153;tow-truckâ&#x20AC;?. While we waited we spent a pleasant few hours with the Te Awa owners who had come to this farm from our home district and we swapped memories and anecdotes about numerous acquaintances. Once our car Tilly had been loaded on the truck we said farewell and went with it back to Palmerston North, feeling many bumps due to the stiff suspension. Thus ended the long rally day. Others can tell you about their lunch stop, afternoon and Happy Ending. New Members contact the Secretary, Peter Robinson, to organise to collect their name badge. Tourer and mail it to the address on the form. 	If you would like the form emailed to you so that you can avoid having to cut into your Tourer, email the Rally Organiser requesting that a PDF version be emailed to you. 	Alternatively forget the form and just send an email to the Rally Organiser with all of the details that are requested on the form included in the email text. Payment Options: 	Send a cheque in the post with your entry form. 	Pay on the day. 	Email the Rally Organiser requesting account details so that you can pay by internet banking. Rally Organiser: Bryan Abraham phone (06) 358 4014 Rally Organiser email: bryana@xtra. co.nz Entries Close: Saturday 27 April 2019. Reports SUNDAY PICNIC – 24 February 2019 Wet weather isn’t usually the best way to entice people out for a picnic and on this occasion the weather probably did make a little dent in the numbers, but even with six cars and eleven people it was a good run with an enjoyable picnic at the other end. The route took the group across town (via Botanical Road and Park Road) to Fitzherbert Avenue where a left turn was made after crossing the bridge - and then it was along Summerhill Drive, through Aokautere, and into the Ashhurst Domain. A group of Real Estate people were having what looked to be a team building picnic/barbeque in the shelter, but there was plenty of room for all of us and those who braved the inclement day spent the best part of a couple of hours chatting. Many thanks to those who came on the picnic. Feilding Auto Electrical Ltd â&#x20AC;&#x153;All auto electrical faults repaired on Alfas to Zephyrsâ&#x20AC;? The Manawatu Branch met the Tour at Totara College in Dannevirke which was the Day 6 lunch stop. Then a stop at Pahiatua to see Jim Chalmers and his private collection of cars – plus some others he had organised. Then it was over the Pahiatua Track to the clubrooms for tea. The morning tea stop next day was at the Woolshed. Meet after 8.45 am at the Coach House Museum, 121 South Street, Feilding for a tea / coffee before the Rally. The briefing will be at 9.15 am with the first car away at 9.30 am. The route does not include any unsealed roads. You don’t need to pack a picnic for this outing - the morning section of the Rally takes you to a café for lunch. Mileage for the morning section is approx. 75 miles (120 Kms). The afternoon section is approx. 30 miles (50 Kms). There will be no opportunity to purchase petrol during either the morning or afternoon sections of this rally (105 miles (170 Km) in total). There will be an opportunity to purchase petrol before heading home at the end of the afternoon section which finishes at a Café. Mileage back to Palm Nth after afternoon tea is approx. 30 miles (50 Kms). I went to the Doctors the other day, and he said, ‘Go to Bournemouth, it’s great for flu’. So I went - and I got it. Please note that all VCC ID Cards have an expiry. This expiry is upon change of ownership, or 10 years from the issue date. Your vehicle must also be as described on the Card. A Renewal form personalised for each vehicle ID Card is distributed by the National Office to current financial members, approximately 3 months before the expiration. Even if your vehicle has had no changes, this form must be checked, signed and forwarded to your Branch, along with the ID Card (if the photo correctly shows your vehicle in its present state), or three new photos, as stated on the form. Upon receipt at the National Office, the ID Card will be reissued and will be valid for a further 10 years unless there is a change of ownership or major changes to the vehicle during that time. It is compulsory for all National and International VCC Rallies that vehicles entered must have a current valid ID Card. 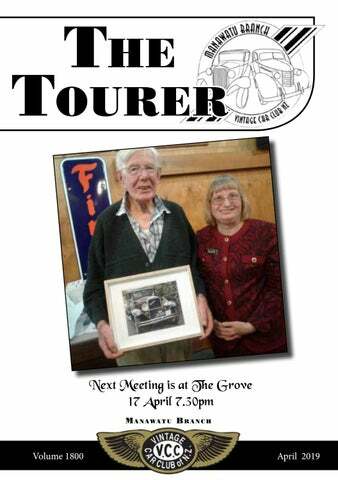 CLOSING DATE FOR NEXT TOURER â&#x20AC;&#x201C; 20TH APRIL 2019 The next issue of the Tourer will be May 2019. 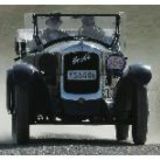 THE TOURER: New Zealand Registered Magazine.